The original title of this post was going to be: "The Top 10 Prescription Drugs". But, as I started to research the top drugs, I realized that the title needed to be stronger and more to the point so that you will take this topic a lot more seriously. Today, the number of people dying from prescription drugs and other medical errors rank it as the Number 3 killer behind heart disease and cancer. The total number of deaths range from 98,000 to 106,000! If you take a look at the drugs associated with 3 of the top diseases in America, you can see that the track record for these drugs is abysmal. Drugs for heart disease end up causing the exact same problems that the drugs were supposed to prevent, namely heart attacks and strokes. Drugs for diabetes lower your blood sugar, but, the drugs don't stop the disease from continuing to rot out your body until one day, you have a heart attack, stroke or you end up with a bruise that doesn't heal and several months later they have to amputate your foot. Drugs for cancer patients may be the worse -- they cause more catastrophic damage than any other drug; plus cancer drugs have less than a 3% success rate! Now, I know what you're thinking: "This is not going to happen to me." Well, the medical data & statistics from the CDC and NIH say otherwise. There's a simple reason why heart attacks, strokes, amputation, etc. continue to increase every year -- we live in denial, fear and/or ignorance and somehow believe that it's just not going to happen. If you doubt of any this, then, do your own research; or, at least, make sure that you read some of the reports identified in this post and take action before you or a loved one become one of those statistics. Most of us are told by our doctors to take drugs, because the drugs are supposed to help us with our disease. Doctors give us the false sense of security that the drugs are actually going to help us. Your doctor fails to tell you that the drugs do NOTHING to stop the spread of the cell and tissue damage being caused by the disease! In fact, over a period of years, the drugs actually cause damage to the liver and/or kidneys among other organs! And, if you have an adverse reaction to the drug, your doctor may not tell you why this is happening -- that the drug is actually POISONING your body. Instead, your doctor will just put you on a different drug or tell you: "Hang in there -- you'll be okay." WHAT??? Is this all we get for a $250 appointment? So, you should be very careful, not to jump at taking a drug just because your doctor has assured you that it's okay! Just take 30 seconds and google the drug! And, you'll see that it's NOT okay! And, if you look further, you'll see that, in most cases, there are safe non-drug alternatives! Now, I must admit that I'm being a little hypocritical here -- I didn't take the 30 seconds to google the drug that I was taking. Instead, I took the drugs happily. And, if it weren't for my fear of needles, I would have gladly continued taking the drugs and injecting myself 4 times a day with insulin. But, because I was afraid of needles, I tried to convince my endocrinologist to reduce my 4 shots down to 3. He smiled and said, given my diagnosis and possible double-leg amputation, that he was considering increasing my insulin shots from 4 to 5! Well, that motivated me to find a solution. Now, don't get me wrong -- I know that drugs save lives -- in fact, drugs saved my life. So I'm thankful for the drugs. But, being told that I would have to take the drugs for the rest of my life just didn't make any sense to me. And, it shouldn't make any sense to you. Some of you have been taking diabetic drugs for years -- do you really think that your body will continue to absorb these toxins without incidence? Long-term use of drugs for heart disease, diabetes, high blood pressure, etc. lead to many health problems, including heart failure, liver failure, kidney failure and death. One of the most popular drugs (statins) is popular because we think that it's going to prevent a heart attack. Ever since statins were introduced in 1987, heart disease and heart attacks have steadily increased over the past 28 years. In fact, statins can CAUSE a heart attack, along with causing Type 2 diabetes and cancer! Sidebar: Most people believe that high cholesterol causes heart disease and heart attacks so they think that by taking a statin drug that lowers their cholesterol, it will prevent heart disease and a heart attack. Nothing could be further from the truth. High cholesterol is a byproduct as heart disease develops in your body -- it's not the root cause of heart disease. For whatever reason, most people (except maybe engineers :-)) just don't seem to get this -- as more than 70 million people in the U.S. take statins. Metformin is the top drug prescribed to Type 2 diabetics, yet it does absolutely NOTHING to stop the progression of the disease. Sure, it lowers your blood sugar, but the disease continues to rot out the insides of your body! Keep this in mind: 100% of Type 2 diabetics that take metformin or some similar pill end up on insulin if they live long enough. That's right -- not 90%, not 95% -- ONE HUNDRED PERCENT! Statins, ACE inhibitors, diuretics and beta blockers are the top drugs prescribed to people with heart disease, but these drugs do absolutely nothing to stop the progression of the disease, which eventually leads to heart failure, a heart attack or a stroke. 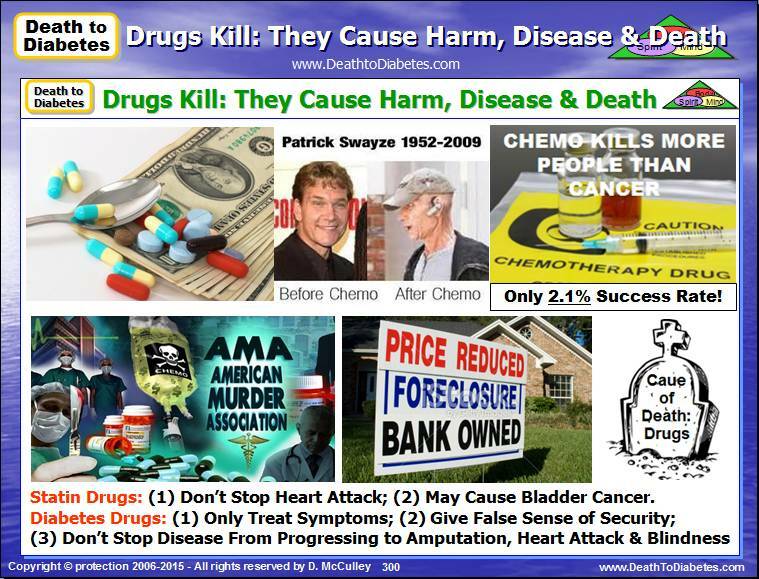 And, no drugs are more toxic than cancer drugs. Chemotherapy and radiation cause more damage and kill more people than the actual cancer! These drugs cause major damage to your immune system and other organs. Chemotherapy is so toxic that the doctors and nurses wear gloves!! What!?! Chemotherapy has proven to only work for a few cancers, but, it's prescribed for ALL cancers, despite the devastation it causes and it's poor track record. 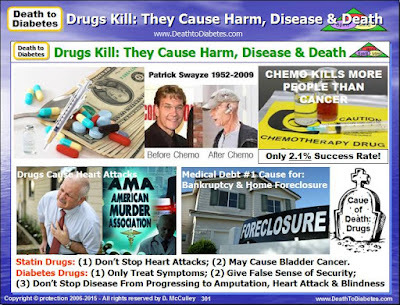 Lies and fear tactics are used to pressure patients into taking the poison; and, so most people take the poison because they are not made aware that there are other safer alternatives! (We will discuss this in more detail in a future post if we can get past the legal issues). Now, don't get me wrong -- drugs are not all bad and doctors are not bad people. So, why don't doctors tell people about safer non-drug options? Because, if they did, they would be reprimanded by the American Medical Association (AMA) and possibly lose their medical license. So, it's not their responsibility to tell us about non-drug alternatives for our diseases -- it's our responsibility. Next to talking about nutrition, the most frequent topic that we write and talk about is the dangers of prescription drugs. Why? Because most of us are willing to take the easy way out and just pop up a pill instead of change our diet! But, no matter how many times we write and talk about the dangers of drugs, the fact of the matter is that 82% of Americans take a prescription drug, including chemotherapy and radiation. And, 29% take 5 or more pills with the average person taking anywhere from 2 to 8 pills a day. I've met people who take as many as 18 pills a day! And, they ask me: "Why am I still sick?" Really? One more thing: Do you know what is the Number 1 cause of bankruptcy in this country? It's medical debt. 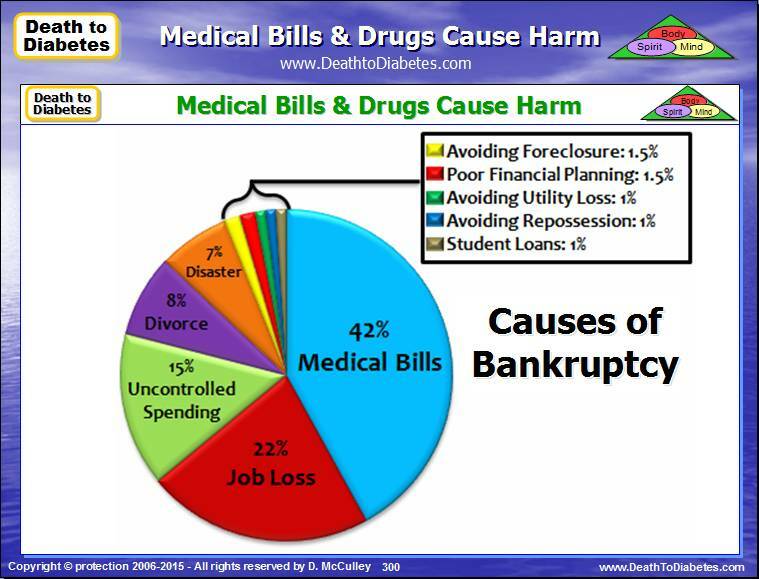 And, medical debt is also the Number 1 reason why families lose their homes. And, one last thing (I promise :-)): When we rely on drugs, we are sending a message to our children that drugs are okay; and, guess what? They end up following in our foot steps! So, here we are: Dying from disease and drugs; and, going broke at the same time; and sending our children down the same path. And, yet we do nothing. We say nothing. We keep our mouths shut and think: "It's not going to happen to me." Well, even if that's true, is that a good reason to stay quiet while millions of others suffer? "The only thing necessary for the triumph of evil is that good men and women do nothing." Edmund Burke. 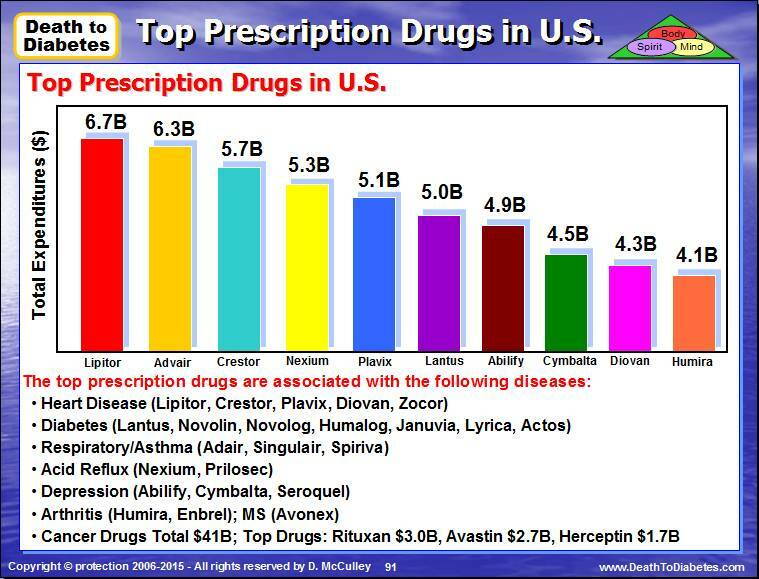 The top-selling drugs are statins, primarily because our doctors and Big Pharma has done an excellent marketng job in convincing us that we need to take statins for our high cholesterol. The next top-selling drugs are diabetic drugs. That shouldn't surprise anyone, since diabetics more so than any other group, choose to pop up a pill because it's easier than changing one's diet. 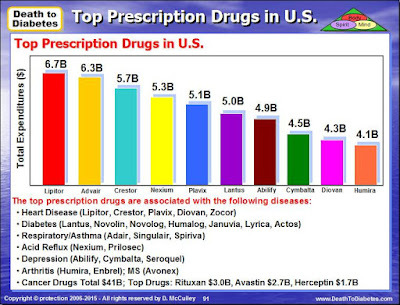 None of the cancer drugs made the top 10 list (below) despite the fact that chemotherapy, radiation, etc. generate $41 billion of revenue. Prescription drugs are the 4th leading cause of death around the world. The pharmaceutical industry is committing a silent holocaust around the globe. People are sick because they aren’t getting proper nutrition. Then they are covering up their sickness with a doctor-prescribed pill. But this is causing some serious side effects, leading their doctors to prescribe more pills to conceal those side effects. The following is a list of the 7 most dangerous and heavily promoted prescription drugs. The bottom line is that taking a long term medication which alters any of your natural body functions is obviously dangerous. This includes all the drugs used for heart disease, cancer, stroke and diabetes -- 4 of the top 10 killer diseases. While prescription pills are beneficial in some cases, we believe that superior nutrition is the most powerful type of medicine. Our body is truly a remarkable machine naturally built for optimal function, but this is only when we provide our body with all of the essential nutrients that it needs. When we are not supplying our bodies with proper nutrition, disease eventually manifests in our bodies. This is usually when most people will resort to prescription drugs. These drugs only cover up the problem, but are never actually dealing with the root cause. Besides changing what we eat (to stop poisoning our bodies), the easiest thing that you can do right now is what we've asked you to do in the past. Forward this information and begin talking about this on your own Facebook pages and timelines. We can't do this alone. But, together we can affect change. Who knows, you might reach a person who doesn't know about the dangers of prescription drugs. Of course, Big Pharma is banking on you doing absolutely nothing. And, as long as we do nothing, we will all suffer -- one way or the other we will pay for our apathy. Food for Thought: Diseases like diabetes and cancer are rotting out your insides. 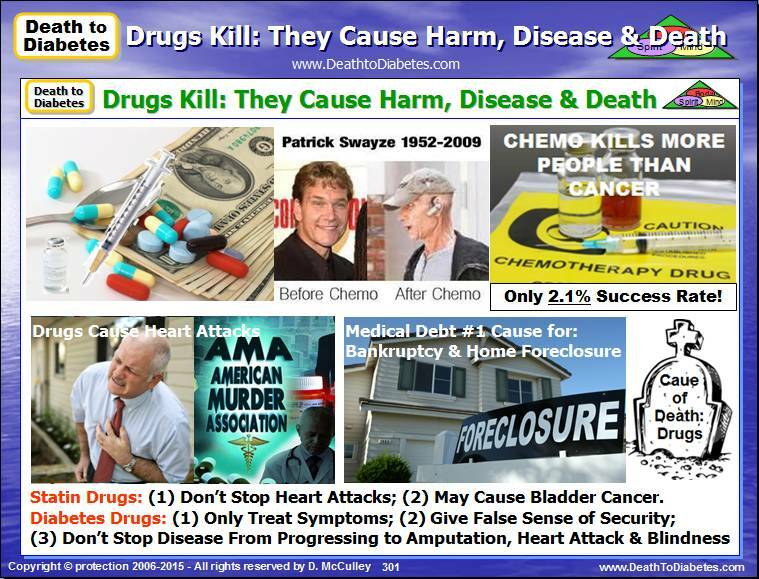 So, do you truly believe that a drug is going to stop the rot? A body that is full of disease is lacking NUTRIENTS, not DRUGS. And, as long as we rely on drugs, the doctors and Big Pharma will continue to give us the drugs while lining their pocketbooks with billions of dollars. Question: So, what are you going to do this time? Ignore this (again) and do nothing or stand up for yourself, your family and your friends? Why Are Medical Mistakes Our Third Leading Cause of Death? Unfortunately, these cancers affect very few people. 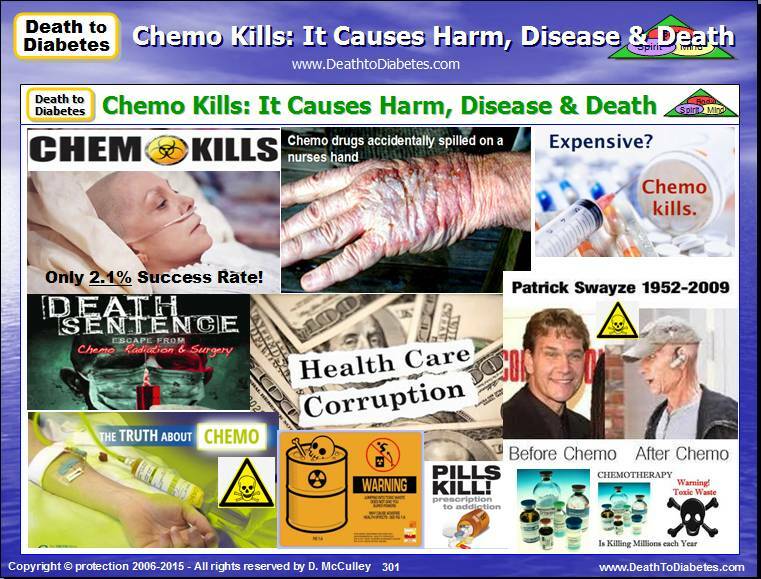 If your cancer is not on the list, and yet, you are being administered chemotherapy, you’re being killed for profit. If you have great faith in them, the chemo‘s plain purpose is to kill the cancer cells, without them ever mentioning that it also kills healthy cells. Another big fallacy on why you’re being administered chemo is to clean up and prevent the spread of any remaining cancer cells (metastasis), if any left, after surgery. It’s as if the chemo will kill all those cancer cells. 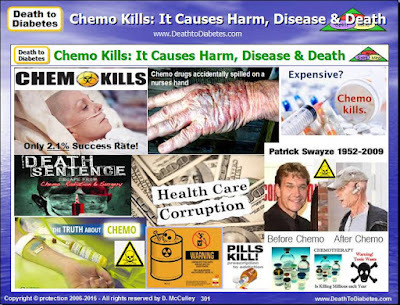 If you’re not on Dr. Zubrod’s cancer list above, why are you being administered chemo that will just ravage your body and make you very poor before you die? Chemo and radiation also kill healthy cells and the highest survival rate for chemo is 22% only (2009 Survival Rates, US National Cancer Institute). In fact, studies now show that chemo damages and kills more healthy cells than cancer cells! B-cells produce antibodies; T-cells conduct surveillance for potentially dangerous molecules and kills dangerous cells such as disease-causing bacteria; and macrophages are the scavenger cells of your body acting like garbage trucks, cleaning up residue and removing potentially dangerous substances. A surveillance team of cells determines whether newly introduced pathogens or molecules pose a threat to your system. A reaction occurs when your body identifies molecules as potentially harmful and toxic -- these molecules are called antigens. The surveillance cells bind to the antigens activating the immune cells to release cytokines and other chemicals which then signals the scavenger macrophages to come to the site and destroy them. When the surveillance immune cells bind to an antigen and send out chemical messengers, they also communicate to the B-cells, which are instructed to make antibodies to the antigen. An antibody will only bind one specific antigen and nothing else. When the antibody binds, or sticks, to the dangerous molecule it is acts like a red flag identifying the molecule as something potentially damaging that should be removed. Your macrophage cells are often called the 'scavenger' cells of the immune system and are specifically designed to remove damaging molecules from the body. After the antibody binds to a dangerous molecule the macrophages consume the molecule, taking it out of circulation and destroying it. Note 1: The “B” Cell becomes a Memory “B” Cell to recall the invader if it should return. 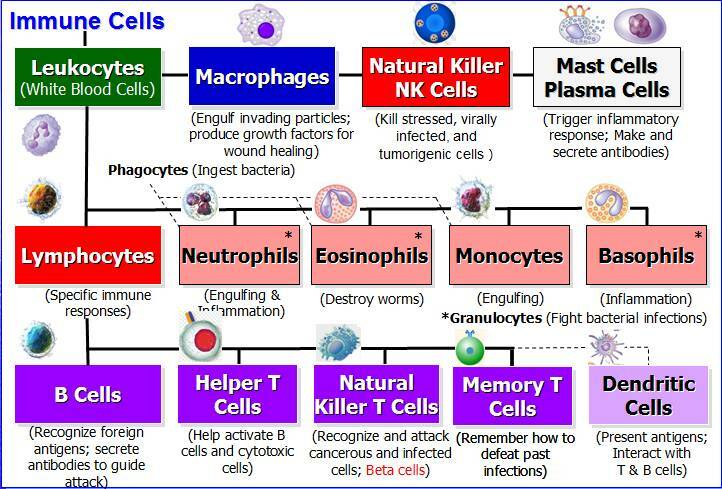 Note 2: The macrophage presents small pieces of the antigen to notify other immune cells such as T Cells. 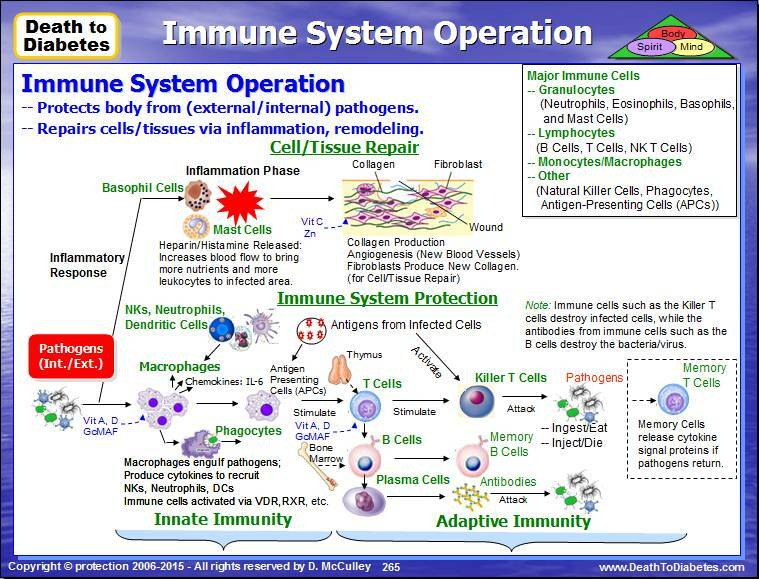 The following diagram is a high-level overview depiction of how the immune system and its cell function to protect you and fight internal and external pathogens and other harmful molecules. A microRNA (abbreviated miRNA) is a small non-coding RNA molecule (containing about 22 nucleotides) found in plants, animals, and some viruses, which functions in RNA silencing and post-transcriptional regulation of gene expression. MicroRNAs (miRNAs) typically inhibit the translation and stability of messenger RNAs (mRNAs), controlling genes involved in cellular processes such as inflammation, cell-cycle regulation, stress response, differentiation, apoptosis, and migration. Thus, miRNAs have been implicated in the regulation of virtually all signaling circuits within a cell, and their dysregulation has been shown to play an essential role in the development and progression of cancer. The emergence of microRNAs has been one of the defining developments in cancer biology over the past decade, and the explosion of knowledge in this area has brought forward new diagnostic and therapeutic opportunities. The importance of microRNAs in cancer has been underlined by the identification of alterations in microRNA target binding sites and the microRNA processing machinery in tumor cells. Clinical trials utilizing microRNA profiling for patient prognosis and clinical response are now underway, and the first microRNA mimic entered the clinic for cancer therapy in 2013. Micro-RNA Molecules from Your Food May Control Up to 30 Percent of Your Genes Groundbreaking new research shows that microscopic RNA in the plants you consume enters your body and is actually capable of affecting the expression of up to 30% of your genes! Never before could it have been imagined that your "genes" could be so profoundly affected by things you eat. There is also the field of lectinology, which has opened our eyes to how plants – particularly grains and legumes – have a set of defenses, not unlike "invisible thorns," which can cause direct, non-immune mediated harm to a wide range of tissues and organs within your body. Medical science is beginning to awaken to how profoundly food is intertwined with health and disease, and how nutrients affect genes, and how our genes respond to nutrients. This, in fact, is the field of study known as Nutrigenomics – something you will be hearing far more about as the science begins to gain wider appreciation. It is a burgeoning new field, in fact launched soon after the completion of a working draft of the Human Genome project (2003), which failed to provide the long sought after "holy grail" of modern biology. In a nutshell, the project failed to identify one gene for every one protein in the human body, forcing researchers to look to epigenetic factors -- namely, "factors beyond the control of the gene" – to explain how the body is formed, and how it works. What is the most important factor beyond the control of the gene? Diet. Chances are you've never heard of micro RNA (miRNA) … but that doesn't mean it hasn't already been impacting your health … RNA is one of three major macromolecules, like DNA. Micro RNA are basically small pieces of RNA that interact with your genes, essentially stopping certain genes from being expressed. MiRNA exists in human body fluid naturally; for instance, researchers have detected high expression levels of immune-related miRNAs in breast milk, particularly during the first 6 months of lactation. It's thought that this genetic material is transferred from mother to baby to help modulate the development of the infant's immune system. Cow's milk also contains miRNA, which is currently being explored as a possible new standard for the quality control of raw milk. However, micro RNA also exists in plants, and for the first time research has shown that eating the wrong plants may transfer this plant miRNA to humans -- with potentially devastating implications. The study, published in the September 2011 edition of the journal Cell Research, determined that microRNA from cooked plant foods like rice, wheat and potatoes can in fact collect in your blood and tissue, leading to a number of potential health problems. The study further revealed that microRNA remains completely stable after not only cooking, but through the digestion process as well. Most importantly, the researchers found a significant quantity of microRNA in the human body. So whenever you eat rice and certain other plant foods, including potatoes and wheat, you are ingesting genetic material that may turn certain genes "off." To date, microRNA has been implicated in a number of diseases ranging from cancer and diabetes to Alzheimer's disease. MicroRNA has been widely shown to alter many critical biological processes, including apoptosis – the process of programmed cell death and DNA fragmentation. As a result, the dysregulation of microRNAs has been linked to cancer and various other diseases. However microRNA are also responsible for regulating your genes on a very large scale. As mentioned, it has been estimated that miRNAs account for less than 1% of genes in mammals, but that up to 30% of genes are regulated by them. Amazingly, microRNAs are known to regulate the flow of genetic information by controlling the translation or stability of something known as messenger RNAs, which is a molecule of RNA that carries valuable genetic coding information within your body. What's more, this plant miRNA has been shown to interfere with human microRNA by mimicking it and binding to the receptors. In the study, researchers examined the two highest levels of these microRNAs in human participants, and found that it is shockingly prevalent among many dietary plant staples. "Upon investigation of the global miRNA expression profile in human serum, we found that exogenous plant miRNAs were consistently present in the serum of healthy… men and women." What you eat, therefore, is who you are in the most literal sense possible.This fact, while often overlooked, is fundamental in understanding how to optimize your health. If you eat the right foods, you thrive; eat the wrong foods, and you suffer. It can take a lifetime to figure out how to perfect a diet, particularly one suitable for you as an individual. The good news is that modern research is beginning to make headway in figuring out what is good for virtually all humans, at least in most cases. Certain foods appear to be problematic for many … and most grains continue to be at the top of this list. Given the knowledge that the food you consume ultimately becomes the life source of your entire body, it is important that you eat well not only to utilize vital nutrients but also to optimize your genetic expression. Key foods to eat include vegetables, fruits, plant oils, fish, nuts and seeds; while avoiding refined sugar, flour, processed foods and most animal meats. Refer to the post about the Top 10 Foods for the Immune System. But, remember: your diet is but one way to influence your genetic expression. Your emotions, pharmaceutical drugs, and exposure to pollutants play a role in how your genes are expressed. Most of us don't really think about our immune systems, except just before winter sets in and a lot of health practitioners in the news, on the radio, in social media and on television are talking about the upcoming flu season and what we should do, e.g. get a flu shot or not. In the meantime, we all run out and pick up a bunch of herbs, vitamins, teas and other concoctions, hoping to avoid catching a cold or the flu this year. 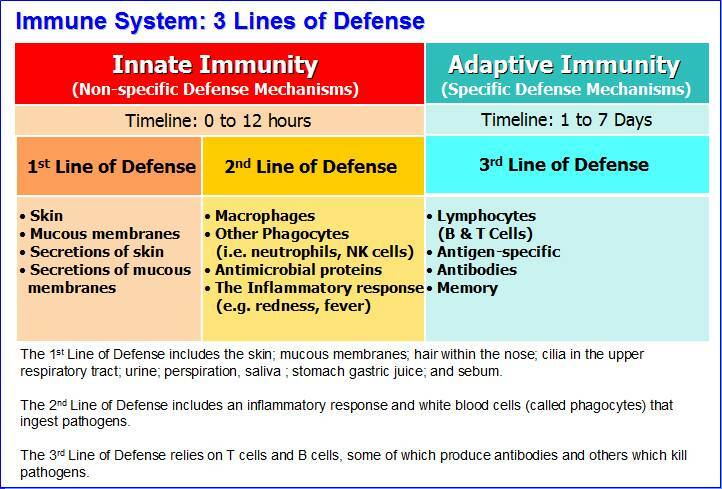 The immune system is one of the 11 major systems in the human body. It protects us from invading microbes and pathogens such as bacteria, fungi, viruses, parasites, etc. In addition, the immune system plays another major role that most people (including doctors) don't really know that much about -- have any idea what it is? Whether you're diabetic or not, it is important that you keep your immune system strong to protect you against most diseases and illness, including the flu and the common cold. And, although the immune system is important regardless of your specific health problem, it plays an even bigger role in protecting you by helping to heal damaged cells and tissues. As a result, your immune system plays a major role in helping to protect you from cancer and helping to repair and heal your body if you happen to have cancer. This isespecially since the conventional medical treatment for cancer patients is to poison them with chemotherapy and/or radiation, which severely weakens the immune system and the patient. 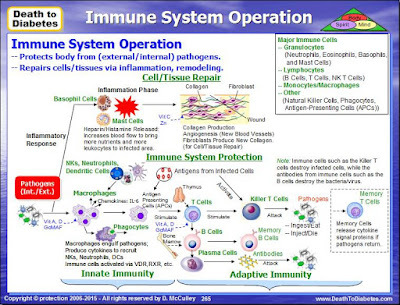 Your immune system protects your body against disease by identifying and killing pathogens and tumor cells. It detects a wide variety of agents, from viruses to parasitic worms, and needs to distinguish them from your own healthy cells and tissues in order to function properly. Detection is complicated as pathogens can evolve rapidly, and adapt to avoid the immune system and allow the pathogens to successfully infect our bodies. When you catch a cold or the flu; or, when you develop a disease such as diabetes or cancer, the primary reason is due to inflammation and a weakened immune system that is unable to defend your body against the invading pathogens, viruses, fungi, and parasites. In addition, your (weakened) immune system is unable to protect you from other health issues such as high blood pressure, high cholesterol, chronic fatigue and weight gain. FYI: Believe it or not, a lot of unwanted weight gain is triggered by chronic inflammation -- not excess calories! Consequently, two of the most critical steps in being able to successfully prevent or defeat any illness or disease are to reduce the inflammation and strengthen the immune system. But, first, let's take a look at how the immune system works. Physical Barriers include: the skin; mucous membranes; hair within the nose; cilia which lines the upper respiratory tract; urine which flushes microbes out of the urethra; defecation and vomiting which expel microorganisms. Chemical Barriers include: lysozyme, an enzyme produced in tears, perspiration, and saliva can break down cell walls and thus acts as an antibiotic (kills bacteria); stomach gastric juice which destroys bacteria and most toxins; sebum (unsaturated fatty acids) provides a protective film on the skin and inhibits growth. The second line of defense is nonspecific resistance that destroys invaders in a generalized way without targeting specific individuals. White blood cells (called phagocytes) ingest and destroy all microbes that pass into body tissues. In addition, there is an inflammatory response in the localized tissue where the pathogen invaded the body or where the tissue was damaged due to a cut or wound. Inflammation brings more white blood cells to the site where the microbes have invaded. The inflammatory response produces swelling, redness, heat, pain and fever. Fever inhibits bacterial growth and increases the rate of tissue repair during an infection. The third line of defense is specific resistance. This system relies on antibodies, which are produced by specific immune cells (called B cells) in response to the antigens on the surface of the invading pathogens. When an antigen is detected by a macrophage, this causes the T cells to become activated. The activation of T cells by a specific antigen is called cell-mediated immunity. The body contains millions of different T cells, each able to respond to one specific antigen. The T cells secrete interleukin 2, which causes the proliferation of certain cytotoxic T cells and B cells. T cells stimulate B cells to divide, forming plasma cells that are able to produce antibodies and memory B cells. If the same antigen enters the body later, the memory B cells divide to make more plasma cells and memory cells that can protect against future attacks by the same antigen. When the T cells activate (stimulate) the B cells to divide into plasma cells, this is called antibody-mediated immunity. Antibodies (also called immunoglobulins) are Y-shaped proteins that circulate through the blood stream and bind to specific antigens, thereby attacking microbes. The antibodies are transported through the blood and the lymph to the pathogen invasion site. The body contains millions of different B cells, each able to respond to one specific antigen. Antibodies bind to an antigen, preventing its normal function or making it easier for phagocytic cells to ingest them; or, they activate a complement protein that kills the pathogen or signals other white blood cells; or they binds to the surface of macrophages to further facilitate phagocytosis. Thymus: is located between your breast bone and your heart and is responsible for producing thymosin, which helps to activate T cells. As we get older, this organ shrinks over 80% and produces less thymosin and may be one of the reasons why our immune system weakens and we become more susceptible to certain diseases. Spleen: filters the blood looking for foreign cells (the spleen is also looking for old red blood cells in need of replacement). A person missing their spleen gets sick much more often than someone with a spleen. Lymph system: includes the tissues and organs, including the bone marrow, spleen, thymus, and lymph nodes, that produce and store cells that fight infection and disease. The channels that carry lymph are also part of this system. Lymph is a clear-like liquid that bathes the cells with water and nutrients. Lymph is blood plasma -- the liquid that makes up blood minus the red and white cells. Think about it -- each cell does not have its own private blood vessel feeding it, yet it has to get food, water, and oxygen to survive. Blood transfers these materials to the lymph through the capillary walls, and lymph carries it to the cells. The cells also produce proteins and waste products and the lymph absorbs these products and carries them away. Any random bacteria that enter the body also find their way into this inter-cell fluid. One job of the lymph system is to drain and filter these fluids to detect and remove the bacteria. Small lymph vessels collect the liquid and move it toward larger vessels so that the fluid finally arrives at the lymph nodes for processing. Bone marrow: produces new blood cells, both red and white including B cells. In the case of red blood cells the cells are fully formed in the marrow and then enter the bloodstream. In the case of some white blood cells, the cells mature elsewhere. The marrow produces all blood cells from stem cells. They are called "stem cells" because they can branch off and become many different types of cells - they are precursors to different cell types. Stem cells change into actual, specific types of white blood cells. White blood cells: also called leukocytes, are probably the most important part of your immune system. These cells work together to destroy bacteria and viruses. The different types of white blood cells include: Neutrophils, Eosinophils, Basophils, Monocytes, Lymphocytes, B cells, T cells, Helper T cells, Suppressor T cells, Killer T cells, Granulocytes, Plasma cells, Phagocytes, Dendritic cells, Natural Killer cells, and Macrophages. Antibodies: (also referred to as immunoglobulins) are produced by white blood B cells. They are Y-shaped proteins that each respond to a specific antigen (bacteria, virus or toxin). Antibodies come in five classes: Immunoglobulin A (IgE), Immunoglobulin D (IgE), Immunoglobulin E (IgE), Immunoglobulin G (IgG), and Immunoglobulin M (IBM). Antigen: The surface of every cell is covered with molecules that give it a unique set of characteristics. These molecules are called antigens. Antigens are generally fragments of protein or carbohydrate molecules. There are millions of different antigens and each one has a unique shape that can be recognized by white blood cells. The white blood cells then produce antibodies to match the shape of the antigens. Some antigens (e.g. associated with bacteria, viruses, pollen, etc.) stimulate an immune response by a white blood (B) cell to generate antibodies specific to that antigen that matches the shape of the antigen. Now the antibody can bind to that specific antigen to make it easier for other white blood cells to engulf or attack the bacteria or virus who brings the antigen with them. The antigens on the surface of bacteria, viruses and other pathogenic cells are different from those on the surface of your own cells. This enables your immune system to distinguish pathogens from cells that are part of your body. Antigens are also found in foods like peanuts and on the surface of foreign materials like pollen, pet hairs and house dust where they can be responsible for triggering an allergy, hay-fever or asthma attacks. Note: An antigen can be any substance (not just bacteria or viruses) that causes your immune system to produce antibodies against it, e.g. peanuts, pollen. Lymphokines: are several hormones generated by components of the immune system. It is also known that certain hormones in the body suppress the immune system. Steroids and corticosteroids (components of adrenaline) suppress the immune system. Tymosin (thought to be produced by the thymus) is a hormone that encourages lymphocyte production. Interleukins are another type of hormone generated by white blood cells. For example, Interleukin-1 is produced by macrophages after they eat a foreign cell. IL-1 has an interesting side-effect - when it reaches the hypothalamus it produces fever and fatigue. The raised temperature of a fever is known to kill some bacteria. Lymphokines are a subset of cytokines that are produced by lymphocytes. They are protein mediators typically produced by T cells to direct the immune system response by signaling between its cells. Lymphokines have many roles, including the attraction of other immune cells, including macrophages and other lymphocytes, to an infected site and their subsequent activation to prepare them to mount an immune response. Circulating lymphocytes can detect a very small concentration of lymphokine and then move up the concentration gradient towards where the immune response is required. Lymphokines aid B cells to produce antibodies. Important lymphokines secreted by the T helper cell include: interleukin 2, 3, 4, 5, 6; granulocyte-macrophage colony-stimulating factor; and interferon-gamma. Cytokines: are small peptides that act as signaling systems within the body. Because they facilitate communication between the innate and adaptive immune systems, cytokines are a key factor in fighting infection and maintaining homeostasis. Cytokines include chemokines, interferons, interleukins, lymphokines, tumor necrosis factor. Cytokines are produced by a broad range of cells, including immune cells like macrophages, B lymphocytes, T lymphocytes and mast cells, as well as endothelial cells, fibroblasts, and various stromal cells. Proinflammatory cytokines such as interleukin 1 (IL-1) and tumor necrosis factor alpha (TNF-alpha) are released defensively in response to infection and trauma. Anti-inflammatory cytokines such as transforming growth factor beta (TGF-beta) and IL-10 oppose the action of the proinflammatory cytokines and promote healing. Some cytokines are chemical switches that turn certain immune cell types on and off. One cytokine, interleukin 2 (IL-2), triggers the immune system to produce T cells. IL-2’s immunity-boosting properties have traditionally made it a promising treatment for several illnesses. Elevated plasma levels of proinflammatory cytokines are biomarkers of inflammation and/or disease. An imbalance between the activity of proinflammatory and anti-inflammatory cytokines is believed to affect disease onset, course, and duration. Anti-inflammatory cytokines is a general term for those immunoregulatory cytokines that counteract various aspects of inflammation, for example cell activation or the production of pro-inflammatory cytokines, and thus contribute to the control of the magnitude of the inflammatory responses. These mediators act mainly by the inhibition of the production of pro-inflammatory cytokines. The major anti-inflammatory cytokines are IL4, IL10, and IL13, and IL35. Other anti-inflammatory mediators include IL16, IFN-alpha, TGF-beta, IL1ra, G-CSF, as well as soluble receptors for TNF or IL6. Tonsils: are lymphoepithelial tissues facing into the aerodigestive tract. These tissues are the immune system's first line of defense against ingested or inhaled foreign pathogens. The fundamental immunological roles of tonsils aren't yet understood. Skin: is one of the most important parts of the body because it interfaces with the environment, and is the first line of defense from external factors, acting as an anatomical barrier from pathogens and damage between the internal and external environment in bodily defense. Langerhans cells in the skin are part of the adaptive immune system. Liver: has a wide range of functions, including immunological effects—the reticuloendothelial system of the liver contains many immunologically active cells, acting as a "sieve" for antigens carried to it via the portal system. Bowel: There is lymphatic tissue in the bowel and in other mucous membranes in the body. The bowel plays a central role in defending the body against pathogens: More than half of all cells that produce antibodies are found in the bowel wall, especially in the last part of the small bowel and in the appendix. These cells recognize pathogens and other non-self substances, and mark and destroy them. They also store information on these non-self substances to be able to react faster the next time. The large bowel also contains bacteria that belong to the body, called gut flora. These good bacteria in the large bowel make it difficult for other pathogens to settle and to enter the body. 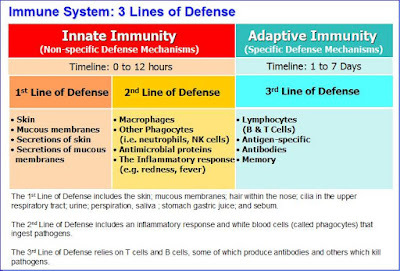 The protection provided by the immune system is divided into two types of reactions: reactions of innate immunity and reactions of adaptive or acquired immunity. The innate immune system consists of cells and proteins that are always present and ready to mobilize and fight microbes at the site of infection. 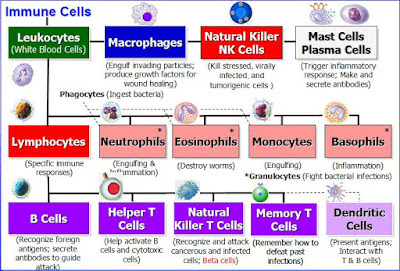 The main components of the innate immune system are 1) physical epithelial barriers; 2) phagocytic leukocytes (neutrophils, eosinophils, basophils); 3) monocytes (which develop into macrophages); 4) dendritic cells; 5) a special type of lymphocyte called natural killer (NK) cells; and, 6) circulating plasma proteins. Other participants in innate immunity include the complement system and cytokines such as interleukin 2 (IL-2). Innate immune cells express genetically encoded receptors, called Toll-like receptors (TLRs), which recognize general danger- or pathogen-associated patterns. Collectively, these receptors can broadly recognize viruses, bacteria, fungi, and even non-infectious problems. However, they cannot distinguish between specific strains of bacteria or viruses. 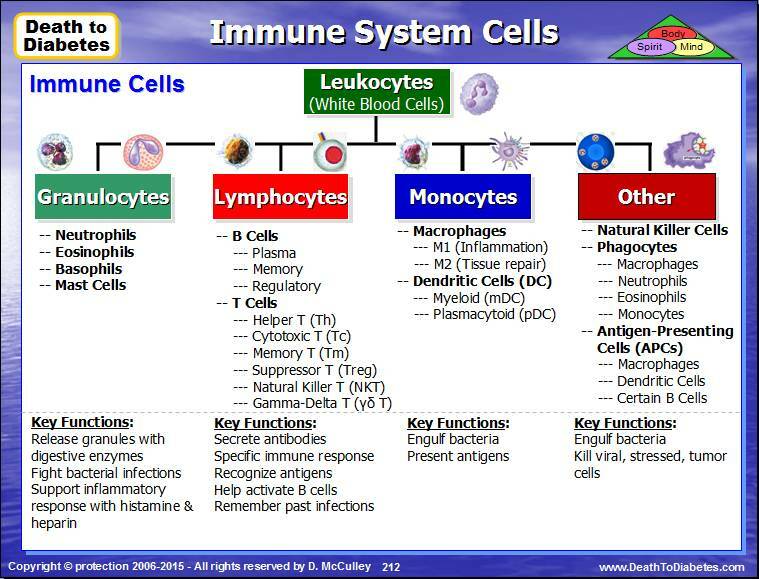 There are numerous types of innate immune cells with specialized functions. They include neutrophils, eosinophils, basophils, mast cells, monocytes, dendritic cells, and macrophages. Their main feature is the ability to respond quickly and broadly when a problem arises, typically leading to inflammation. Innate immune cells also are important for activating adaptive immunity. Innate cells are critical for host defense, and disorders in innate cell function may cause chronic susceptibility to infection. The adaptive (or acquired) immune system is called into action against pathogens that are able to evade or overcome innate immune defenses. Components of the adaptive immune system are normally silent; however, when activated, these components “adapt” to the presence of infectious agents by activating, proliferating, and creating potent mechanisms for neutralizing or eliminating the microbes. 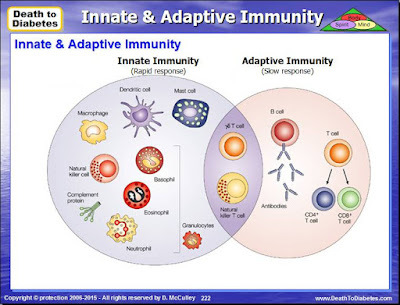 There are two types of adaptive immune responses: 1) humoral immunity, mediated by antibodies produced by B lymphocytes; and, 2) cell-mediated immunity, mediated by T lymphocytes. 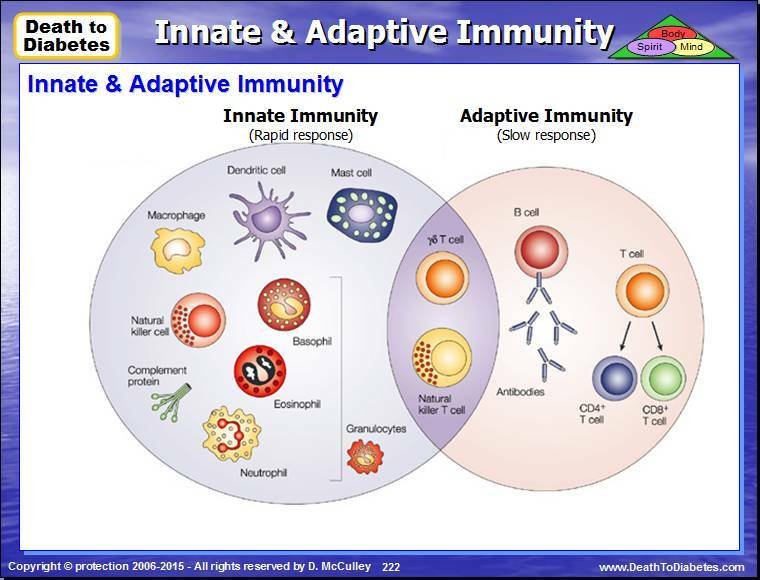 The adaptive immune response is more complex than the innate. The antigen first must be processed and recognized. Once an antigen has been recognized, the adaptive immune system creates an army of immune cells specifically designed to attack that antigen. Adaptive immunity also includes a "memory" that makes future responses against a specific antigen more efficient. Adaptive immune cells are more specialized, with each adaptive B or T cell bearing unique receptors, B-cell receptors (BCRs) and T-cell receptors (TCRs), that recognize specific signals rather than general patterns. Each receptor recognizes an antigen, which is simply any molecule that may bind to a BCR or TCR. Antigens are derived from a variety of sources including pathogens, host cells, and allergens. Antigens are typically processed by innate immune cells and presented to adaptive cells in the lymph nodes. If a B or T cell has a receptor that recognizes an antigen from a pathogen and also receives cues from innate cells that something is wrong, the B or T cell will activate, divide, and disperse to address the problem. B cells make antibodies, which neutralize pathogens, rendering them harmless. T cells carry out multiple functions, including killing infected cells and activating or recruiting other immune cells. Certain T cells (Helper T) help activate B cells to secrete antibodies and macrophages to destroy ingested microbes. They also help activate other T cells called cytotoxic T cells to kill infected target cells. As dramatically demonstrated in AIDS patients, without Helper T cells we cannot defend ourselves even against many microbes that are normally harmless. However, Helper T cells themselves can only function when activated to become effector cells. They are activated on the surface of antigen-presenting cells (APC), which mature during the innate immune responses triggered by an infection. The innate responses also dictate what kind of effector cell a Helper T cell will develop into and thereby determine the nature of the adaptive immune response elicited. The adaptive immune response has a system of checks and balances to prevent unnecessary activation that could cause damage to the host. If a B or T cell is auto-reactive, meaning its receptor recognizes antigens from the body's own cells, the cell will be deleted. Also, if a B or T cell does not receive signals from innate cells, it will not be optimally activated. Immune memory is a feature of the adaptive immune response. After B or T cells are activated, they expand rapidly. As the problem resolves, cells stop dividing and are retained in the body as memory cells. The next time this same pathogen enters the body, a memory cell is already poised to react and can clear away the pathogen before it establishes itself. A further aspect of the adaptive immune system worth mentioning is its role in monitoring body cells to check that they aren't infected by viruses or bacteria, for instance, or in order to make sure that they haven't become cancerous. Cancer occurs when certain body cells 'go wrong' and start dividing in an uncontrolled way. The key tissues and organs involved with the immune system include the lymph nodes, spleen, tonsils, bone marrow, thymus, and lymphatic tissue. 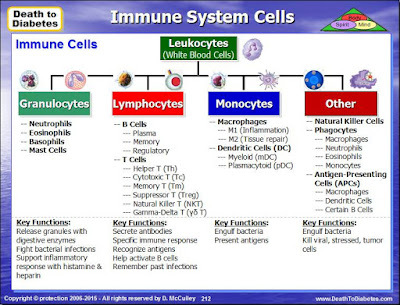 The key immune cells are white blood cells (or leukocytes). 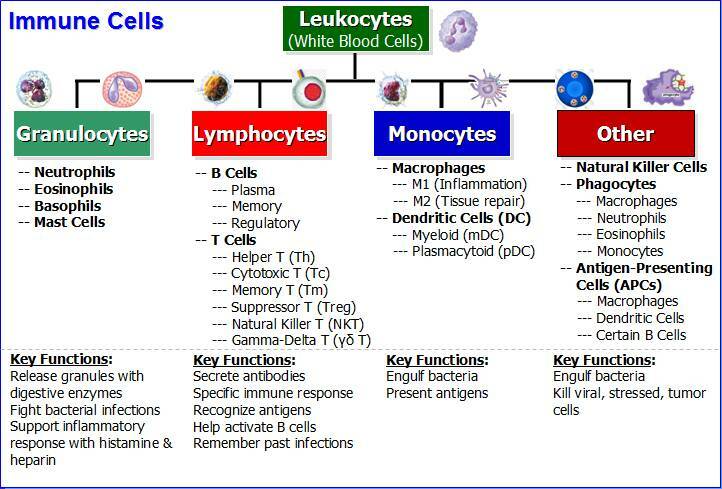 The (3) major categories of white blood cells are: granulocytes, lymphocytes and monocytes. Granulocytes are characterized by the presence of granules in their cytoplasm which contain digestive enzymes that kill various types of bacteria and parasites. Granulocytes are also called polymorphonuclear leukocytes (PMN, PML, or PMNL) because of the varying shapes of the nucleus, which is usually lobed into three segments. The principal types of granulocytes are neutrophils, eosinophils, basophils, and mast cells. Lymphocytes come in three major types: B-lymphocytes (or B cells), T-lymphocytes(or T cells) and natural killer (NK) cells. Lymphocytes start out in the bone marrow and either stay there and mature into B cells, or they leave for the thymus gland, where they mature into T cells. B cells produce antibodies in the humoral immune response and are like the body's military intelligence system, seeking out their targets and sending defenses to lock onto them. With the help of T cells, B cells make special Y-shaped protein antibodies, which stick to antigens on the surface of bacteria, stopping them in their tracks, creating clumps that alert your body to the presence of intruders. Plasma cells, also called plasma B cells, secrete large volumes of antibodies. Memory B cells are important in generating an accelerated and more robust antibody-mediated immune response in the case of re-infection (also known as a secondary immune response). Regulatory B cells (Bregs) participates in immunomodulations and in suppression of immune responses. via production of anti-inflammatory cytokine interleukin 10 (IL-10). T cells recognize and kill virus-infected cells directly. Some help B cells to make antibodies, which circulate and bind to antigens. Others send chemical instructions (cytokines) to the rest of the immune system. Types of T cells include Helper T (Th), Memory T (Tm), Cytotoxic T (Tc), Suppressor T (Treg), and Effector T cells. Helper T Cells (Th) help activate B cells to secrete antibodies and macrophages to destroy ingested microbes, but they also help activate cytotoxic T cells to kill infected target cells. Note: In AIDS patients, without helper T cells we cannot defend ourselves even against many microbes that are normally harmless. Memory T Cells (Tm) are derived from normal T cells that have learned how to overcome an invader by ‘remembering’ the strategy used to defeat previous infections. At a second encounter with the invader, memory T cells can reproduce to mount a faster and stronger immune response than the first time the immune system responded to the invader. Cytotoxic T Cells (Tc) are lymphocytes that kill invading pathogens including cancer cells, cells that are infected (particularly with viruses), or cells that are damaged in other ways. Tc cells kill their targets by programming them to undergo apoptosis. The elimination of infected cells without the destruction of healthy tissue requires the cytotoxic mechanisms of CD8 T cells to be both powerful and accurately targeted. Suppressor T Cells (Treg) suppress the immune response after invading organisms are destroyed by releasing their own lymphokines to signal all other immune-system participants to cease their attack. Effector T cells (also called Helper T (Th) cells), are the functional cells for executing immune functions. Balanced immune responses can only be achieved by proper regulation of the differentiation and function of Th cells. Natural killer (NK) cells are cytotoxic cells that participate in the innate immune response and attack in packs by releasing substances that perforate the "skin" of their victims -- this is death by cell lysis. Monocytes, which are the largest of all leukocytes, fight off bacteria, viruses and fungi. Originally formed in the bone marrow, they are released into the blood and tissues. When certain germs enter the body, they quickly rush to the site for attack within 8–12 hours. Monocytes have several functions to help you ward off diseases and infections. To help you remember what they do, note that each function begins with the letter 'M': Munch, Mount and Mend. Munch: Monocytes have the ability to change into another cell form called macrophages before facing the germs. In response to inflammation signals, monocytes move quickly to sites of infection in the tissues and divide/differentiate into macrophages and dendritic cells to elicit an immune response. They change into macrophages when they move from the bloodstream to the tissues. They consume, or munch, on harmful bacteria, fungi and viruses. Then, enzymes in the monocyte kill and break down the germs into pieces. Mount: Monocytes help other white blood cells identify the type of germs that have invaded the body. After consuming the germs, the monocytes take parts of those germs, called antigens, and mount them outside their body like flags. Other white blood cells see the antigens and make antibodies designed to kill those specific types of germs. Mend: Monocytes help mend damaged tissue by stopping the inflammation process. They remove dead cells from the sites of infection, which repairs wounds. They have also shown to influence the formation of some organs, like the heart and brain, by helping the components that hold tissues together. Macrophages are derived from monocytes, granulocyte stem cells, or the cell division of pre-existing macrophages. Macrophages do not have granules but have receptors to detect, capture and ingest pathogens. Macrophages are found throughout the body in almost all tissues and organs, just below the surface of the skin and mucous membranes — any place where a pathogen could get through the first line of defense. Macrophages cause inflammation through the production of interleukin-1, interleukin-6, and TNF-alpha. Macrophages are usually only found in tissue and are rarely seen in blood circulation. They take up and destroy necrotic cell debris and foreign material including viruses, bacteria, and tattoo ink. In wound healing, macrophages take on the role of wound protector by fighting infection and overseeing the repair process. Macrophages also produce chemical messengers, called growth factors, which help repair the wound. When inflammation occurs, monocytes undergo a series of changes to become macrophages and target cells that need eliminating. Once engulfed, cellular enzymes inside the macrophage destroy the ingested particle. Some macrophages act as scavengers, removing dead cells while others engulf microbes. Another function of macrophages is to alert the immune system to microbial invasion. After ingesting a microbe, a macrophage presents a protein on its cell surface called an antigen, which signals the presence of the antigen to a corresponding T helper cell. Macrophages change into foam cells in the blood vessel walls (endothelium), where they try to fight atherosclerosis by engulfing excessive cholesterol engulf large amounts of fatty substances, usually cholesterol. Foam cells are created when the body sends macrophages to the site of a fatty deposit on the blood vessel walls. The macrophage wraps around the fatty material in an attempt to destroy it and becomes filled with lipids (fats). The lipids engulfed by the macrophage give it a "foamy" appearance. Foam cells are often found in the fatty streaks and plaques inside the blood vessel walls. Foam cells do not give off any specific signs or symptoms, but they are part of the cause of atherosclerosis. Foam cell development can be slowed, however. Decreasing low density lipoprotein (LDL) cholesterol and increasing high density lipoprotein (HDL) cholesterol will remove the lipids that the macrophages engulf to become foam cells. In addition to the monocytes and macrophages, the other types of white blood cells include neutrophils, basophils, eosinophils, mast cells and dendritic cells. Neutrophils defend against bacterial or fungal infection and other very small inflammatory processes. They are usually the first responders to microbial infection; their activity and death in large numbers forms pus. Basophils are chiefly responsible for allergic reactions and antigen response by releasing the chemical histamine, which helps to trigger inflammation, and heparin, which prevents blood from clotting. Eosinophils primarily deal with parasitic worm infections. They are also the predominant inflammatory cells in allergic reactions. Mast cell is a type of granular basophil cell in connective tissue that releases heparin, histamine, and serotonin during inflammation and allergic reactions. Dendritic cells (DCs), which can also develop from monocytes, are an important antigen-presenting cell (APC) whose main function is to process antigen material and present it on the cell surface to the T cells in order to activate the T cells. They act as messengers between the innate and the adaptive immune systems. Once activated, dendritic cells migrate to the lymph nodes where they interact with T cells and B cells to initiate and shape the adaptive immune response. Note: Antigens are molecules from pathogens, host cells, and allergens that may be recognized by adaptive immune cells. Antigen-presenting cells (APCs) like DCs are responsible for processing large molecules into "readable" fragments (antigens) recognized by adaptive B or T cells in order to activate them. However, antigens alone cannot activate T cells. They must be presented with the appropriate major histocompatibility complex (MHC) molecule "tags" expressed on the APC. MHC provides a checkpoint and helps immune cells distinguish between self and non-self cells. An APC can be any of various cells (as a macrophage or a B cell) that take up and process an antigen into a form that when displayed at the cell surface in combination with an MHC molecule is recognized by and serves to activate a specific helper T cell using their T-cell receptors (TCRs). Note: For more details, refer to the DTD Training Program, the DTD Science or the DTD Autoimmune ebook.